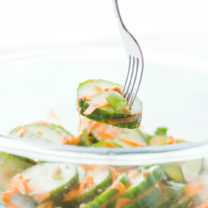 The perfect salad for your summer picnics. 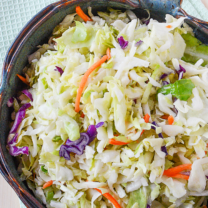 is right around the corner…which means we’re heading into the season of picnics and potlucks. It’s always tricky to figure out what to bring to one of these shindigs. 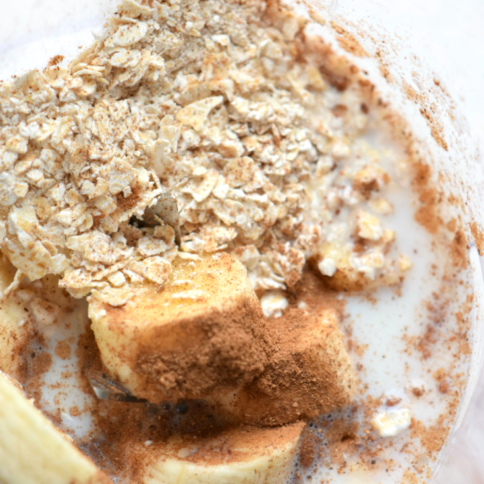 You want something that you can make ahead of time, so you don’t need to mess around in the kitchen. It shouldn’t need to be kept warm, but it also shouldn’t have anything in it that will go bad in the heat, since it could be sitting outside for a few hours. And, of course, you also want it to be delicious. 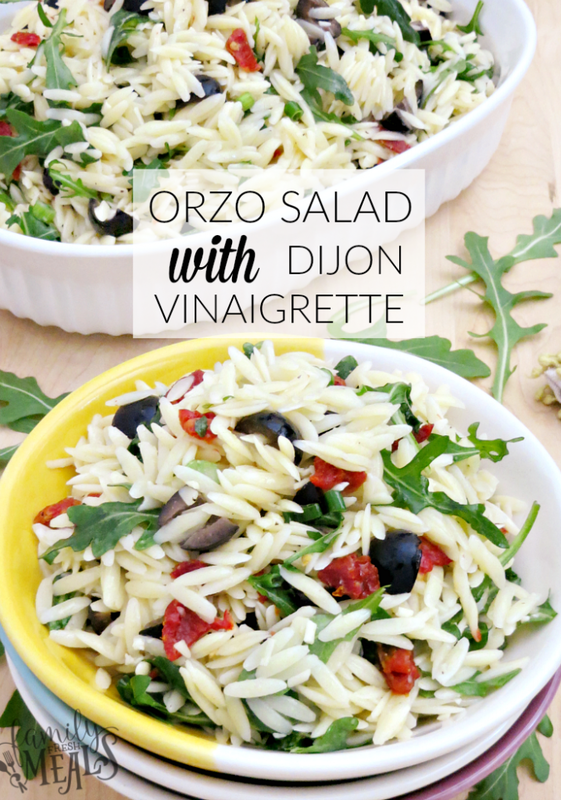 This Mediterranean-inspired Orzo Salad with Dijon Vinaigrette fits the bill perfectly. 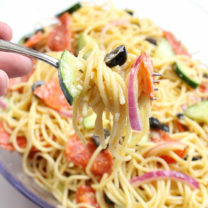 It’s absolutely bursting with flavors and textures! 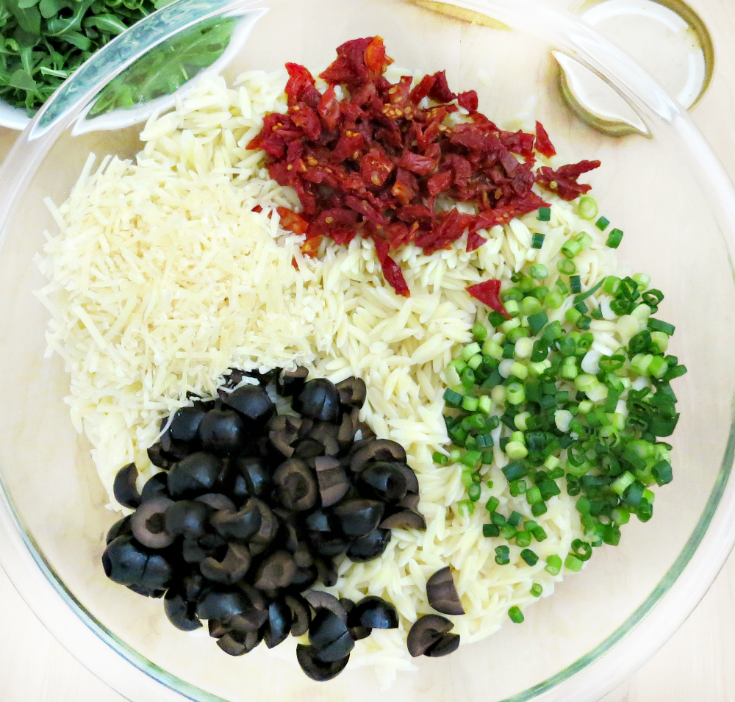 The sun-dried tomatoes are sweet and chewy, while the olives and Parmesan give this a savory, salty bite. 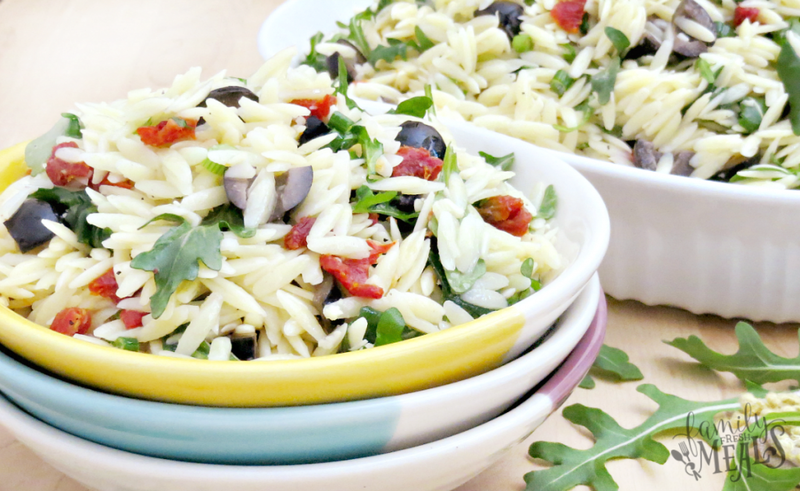 The green onions give it a little crunch and texture, and the arugula is peppery and crisp. Put that all together, and it adds up to…yum. 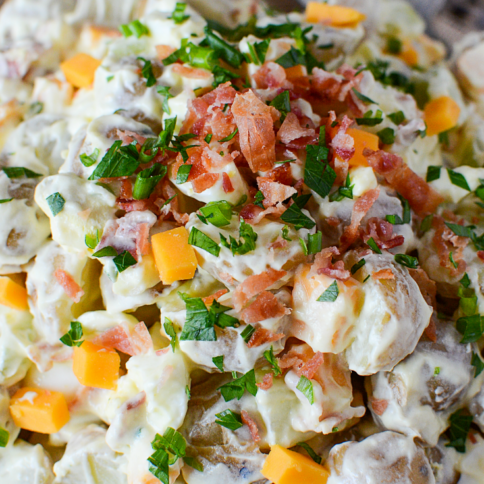 So next time you get invited to a potluck, show up with this salad and impress all your friends. Or, if you don’t get invited to one, make it at home…it’s just as tasty served at your own table. 1. Cook the orzo according to the directions on the package. 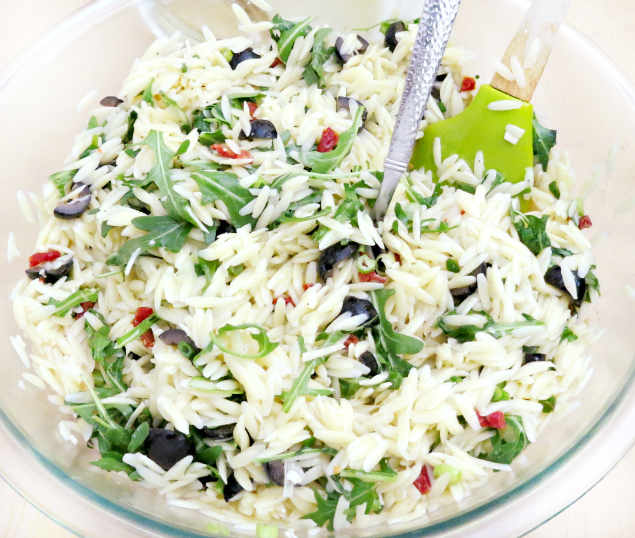 Drain and rinse the orzo very well. 3. Add all of the dressing ingredients to jar with a tight fitting lid and shake for vigorously for 30 to 40 seconds or until creamy. Taste and adjust the dressing to your liking. Add more sugar if you like a sweeter dressing or more vinegar if you like it more vinegary. Pour the dressing over the salad and mix well. 4. Add the arugula to the salad and mix well. Refrigerate for at least 30 minutes before serving. Never miss out on FUN new meals or easy lunchbox ideas for the family and SIGN UP to have my posts sent right to your inbox! It’s EASY PEASY! Just CLICK HERE and enter your email! Cook the orzo according to the directions on the package. 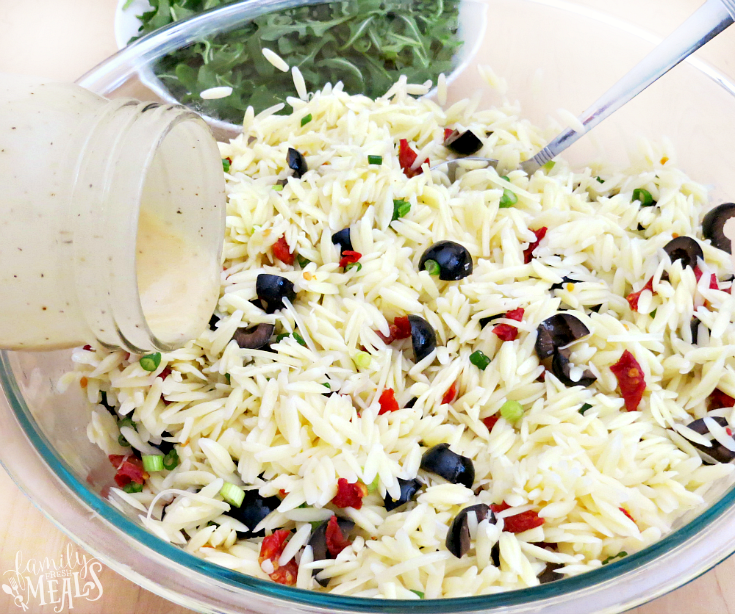 Drain and rinse the orzo very well. Add all of the dressing ingredients to jar with a tight fitting lid and shake for vigorously for 30 to 40 seconds or until creamy. Taste and adjust the dressing to your liking. Add more sugar if you like a sweeter dressing or more vinegar if you like it more vinegary. Pour the dressing over the salad and mix well. Add the arugula to the salad and mix well. Refrigerate for at least 30 minutes before serving. I have only served this recipe cold, so I can’t say for sure. I honestly think it is best served cold.